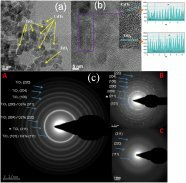 Nanocomposite ZnO-TiO2 powders of varying ZnO/TiO2 molar ratios have been prepared from their salt/compound by heating at 600°C and 900°C and characterized using scanning electron microscope and X-ray diffraction techniques. The nanosized powders can decolorize/degrade brilliant golden yellow (BGY), an azo dye extensively used in textile industries, in water under solar irradiation. The effects of various parameters such as photocatalyst loading, molar ratio of ZnO/TiO2, pH of the solution, initial dye concentration, and irradiation time on the photodecolorization have been investigated. ZnO-TiO2 nanocomposite (6 g/L) in the molar ratio of 1:1 or 3:1, prepared at 900°C, can efficiently decolorize about 98% of 20 mg/L BGY at pH of about 7 by 2-h illumination in sunlight. The initial dye decolorization follows pseudo-first-order kinetics. Finally, trial experiments were done using real textile wastewater to find out the effectiveness of the photocatalysts to a more complex system.